My husband and I traveled a lot before having kids. We loved visiting new places but also going back to our favorite spots. On our list of travels is San Francisco, Indianapolis, Napa Valley, Las Vegas, New York City, Farmington, Pittsburgh, Charlotte, Southport, Nashville and Niagra. We’ve only known each other for six years and our oldest is three years old, so you can see that we were very busy traveling prior to having children. We are both comfortable with airports and only slightly nervous flyers. We are simple and efficient packers (I rarely check a bag when I go on vacation). But ever since having kids, our travel schedule has nearly come to a screeching halt. We are so anxious about traveling with two small children that we decided together that we just wouldn’t do it for the foreseeable future. We have managed to take at least one trip every year with each other but the kiddos have stayed in Ohio with grandparents each time. When I’m at the airport, I always smile at the dad walking his toddler up and down the concourse on his shoulders to waste time before boarding begins. I’m smiling because I miss my toddlers but I am secretly wondering if his 100th lap to the D concourse is worth wherever it is he is going with his family. 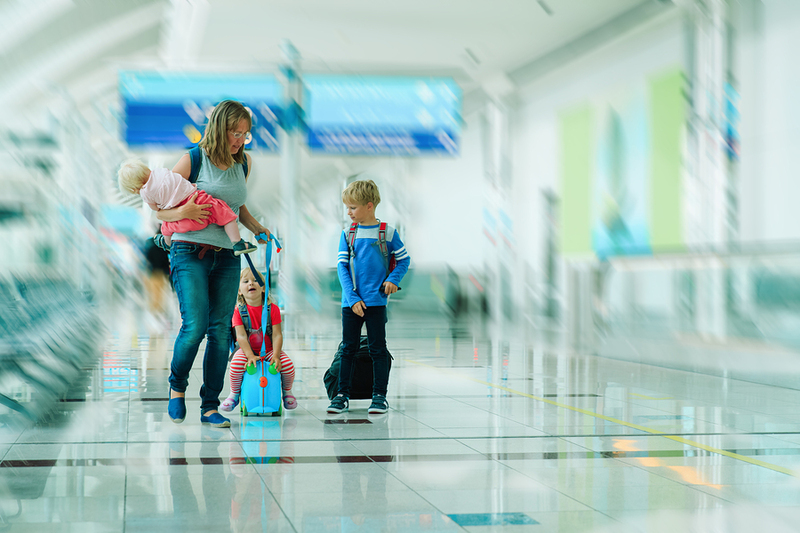 On our last trip to Vegas (my husband and I have gone twice sans kids in the last year), I saw a mother of three with a double stroller pulling out Goldfish crackers and doling them out to her little crew to try to keep them occupied as they waited to board their flight. She was traveling by herself with a baby, a toddler and a child of about 8 years old. She seemed only slightly flustered but I know if I was her, I would be sweating profusely and feeling like I had three ticking time bombs waiting to explode. My kids are actually pretty well behaved so it’s not necessarily acting out that I’m afraid of but just in general the feeling of, “When will the bottom drop out here?” If you know me then you know that I survive being a stay-at-home mom by running a pretty tight schedule of meal times, naps, bedtimes and above all, predictability. Traveling just goes against all of these concepts and I just can’t bring myself to attempt it. When I think of traveling with the kids, I think of all of the things I would need to bring: two car seats, two pack ‘n plays (yes my 3-year-old is still happily in a crib and feels safest sleeping there), a double stroller, the diaper bag, the portable potty, two sound machines, a bag of toys/distractions, snacks, sippy cups, books for bedtime, blankie & bunny, flamingo, big bunny and little bunny and then all of the luggage with our clothes and shoes, etc. Then I think about the scheduling. Do we plan the flights around nap times or bed times or awake times? Do we scratch naps and totally go off schedule? Is flying better than driving 10 hours in a car with two toddlers? My thoughts of traveling pretty much end here because I cannot for the life of me think of somewhere that will be worth packing up all of these things and going through all of the tricks to occupy two toddlers through the airport, the plane ride, the car ride to the hotel, the check-in process, the unpack process and then the “vacation time.” It just never seems like it will be a vacation. They are so young… are they even going to remember it? I’m pretty sure I will remember it and not for fond reasons, but because I would tell myself I’m never doing it again. In fact, most of my friends who have vacationed with their small children have admitted at some point that they made a mistake. I once got a phone call from a friend on a 10-hour road trip with her toddler that there was vomit all over the car and what in the hell was she thinking? And I recall getting a text from pretty much every one of my friends who have vacationed with their toddlers after they get home saying that the transition back to regular life and normal schedules takes another week of crying and resisting and protests. Full disclosure: we have taken the kids to Kalahari twice and both experiences were positive. There were minor hiccups relating to getting my oldest to fall asleep both times, but ultimately we were happy with each trip — mainly because I can easily stomach 90 minutes in the car to get to our destination. That, to me, is doable. I had a trunk load of equipment and I wasn’t on anyone else’s time schedule. Both times at the end of the day, my toddler said he was ready to go home instead of sleeping at the hotel. It’s a lot of fun for a child to have and it wears them out! I can’t imagine bringing them somewhere like Disney at this age and expecting them to see and do it all for days on end. I’m sweating just thinking about it. I fully understand that the relaxing part of vacation is different when you vacation with kids. When we do finally decide to go on a vacation with the kids, I’m prepared to give up the spa treatments and sleeping in and drinks all day at the pool. Wait… am I? Maybe I’ll just stick to what I know works well. Like my backyard. Don’t be afraid. We took our daughter on her 1st trip the day she turned 5. We went to Jamaica and it was a total of about 7 hours of flying with a layover. She was actually really good. We brought her Kindle, earphones, toys/games & plenty of snacks. I highly recommend ear plugs though. She was fine until the last descent and then her ears popped but were fine again when we landed. That sounds doable. Ok so when my youngest turns 5, in 3 years, we will go somewhere. That gives me time to prepare… lol! Oops, mom brain – my oldest was 3 years old, not 5! Take the travel leap! I totally get the anxiety around travelling with little ones. Still, it’s totally worth it! We brought our family of 5 to California from Ohio when my oldest was 5 years old and the twins were 23 months old (taking advantage of the flying under 2 for free). It was an amazing trip, but we had to plan car seats, pack and plays etc. Good news: as the kids get older, you need to pack less stuff. Since California, they have been to Florida, the Dominican Republic and countless 8+ hr road trips to the east coast to visit friends and family. Best yet, we’re heading to Ireland this summer! Thanks for the comment! I think I will definitely feel better about it as they get older and need less stuff!